“Discothèque” was the first single released to promote the Pop album. The initial plan was to release the track to radio in late January 1997, but the date had to be moved forward, to the beginning of that month, due to several leaks on the Internet. In fact, one snippet of the song, taken from an Electronic Press Kit video, had been circulating since October 26, 1996. By the start of the new year the entire song was available online, and several radio stations had begun playing it. The physical single was released on February 3, 1997 in the UK, but some stores in Europe had started selling it as early as January 31st. The domestic release in Canada was delayed another week beyond the release date in other countries. On March 17, 1997, a 3-vinyl 12-inch set was released in Europe, almost a month-and-a-half after the initial single release. In most cases, the 7-inch and two-track cassette and CD versions of the single included a 5:08 mix of “Discothèque” as the A-side. This single version had a slightly different intro and was shorter than the 5:19 album mix, although it was not listed as a “Single Version” on any of these releases. The B-side was “Holy Joe (Garage Mix).” For 12-inch and maxi-cassette and CD versions of the single, numerous remixes of “Discothèque” were added, as well as an additional remix of the B-side, called “Holy Joe (Guilty Mix)” (this song was also included as a bonus track on the Japanese release of Pop). A 4:34 “Radio Edit” of “Discothèque” was also issued on various promos. Three videos for the single were released. The first, directed by Stéphane Sednaoui, featured the band performing in a disco environment, wearing outrageous costumes reminiscent of The Village People. Bono was a police officer, The Edge a biker, Adam Clayton a sailor, and Larry Mullen, Jr. a cowboy. The opening shot of the video zooms in on a mirror ball, with the band appearing to be performing inside. (This foreshadowed the upcoming PopMart Tour, during which the band would literally emerge from a giant mirror ball shaped like a lemon.) The second video was also directed by Stéphane Sednaoui, but was set to “Discothèque (DM Deep Club Edit)” rather than the single version of the song. This second clip again used footage from inside the mirror ball, but opened with a shot of a small mirror ball in a cart full of lemons. Added computer graphics and treatments introduced a “video game” feel, with wireframe lemons moving around objects in space and a lemon that shoots invading “Village People” U2 members out of the sky. The third video, set to the “Discothèque (Hexidecimal Mix)” by Steve Osbourne, opened with a shot of a wireframe ball with U2 in the center. The footage is similar to that found in the other remix video, but is edited very differently. John Bland is credited as the director of this third video. “Discothèque” was played nightly during The PopMart Tour in 1997 and 1998. It was also played during the first and second legs of The Elevation Tour in 2001, but not at every show. During The Vertigo Tour in 2005, it was played only twice, as a song opening the encore, during the third leg of the tour. And on The U2360° Tour it was only performed as a snippet as part of “I’ll Go Crazy if I Don’t Go Crazy Tonight” during shows in 2010 and 2011. A live performance of “Discothèque,” recorded in Mexico City on December 3, 1997, can be found on both the Hasta La Vista Baby! fan club album and PopMart: Live from Mexico City video, as well as on some versions of the “Beautiful Day” single. “Discothèque” was included on The Best of 1990-2000 compilation, albeit in the form of a new, “rockier” version with additional production and mixing by Mike Hedges, called “Discothèque (New Mix).” The B-sides disc accompanying The Best of 1990-2000 included an edited version of “Discothèque (Hexidecimal Mix).” Versions of “Discothèque” have also appeared on various promo-only releases, including “PopMart Sampler,” “Remixes from the 90s,” “New Songs and Mixes from The Best of 1990-2000,” the Taiwan-only “Previous Day,” and a set of 7” singles promoting The Best of 1990-2000. Mastered by Howie Weinberg at Masterdisk, New York. Post production and supervision: Cheryl Engels, Partial Productions, Inc.
Discothèque (12” Version) / (5:08): Music by U2. Lyrics by Bono & The Edge. Recorded by Mark ‘Spike’ Stent and Howie B. Assisted by Rob Kirwan and Femio Hernandez. Mixed by Mark ‘Spike’ Stent. Assisted by Conal Markey. Decks and Loops: Howie B. Contains sample from “Fane” performed by Freeform and written by Simon Pike, courtesy of Skam Records. 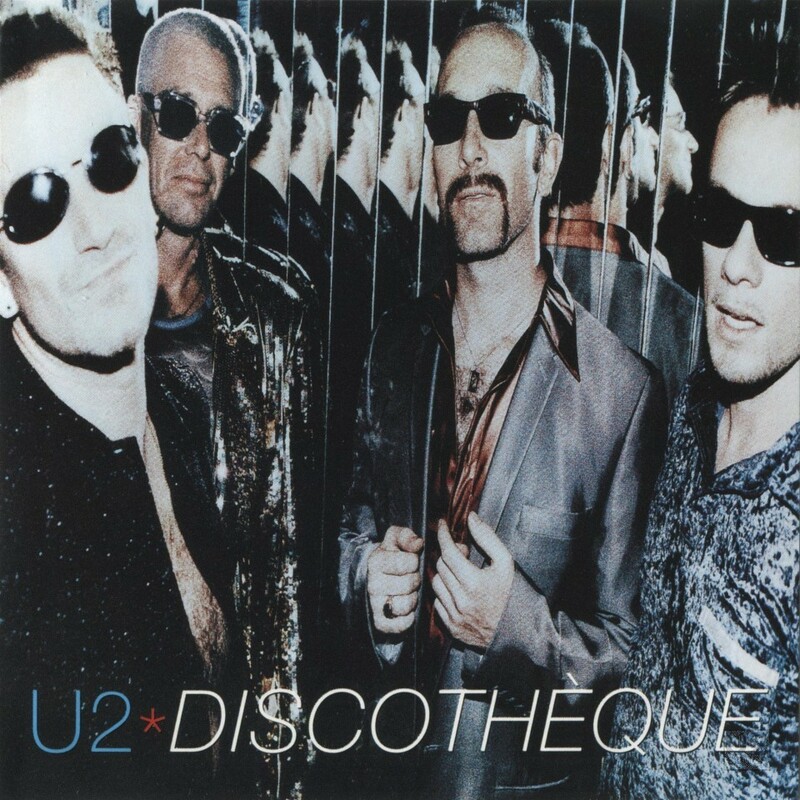 Discothèque (Album Version) / (5:19): Music by U2. Lyrics by Bono & The Edge. Produced by Flood. Recorded by Mark ‘Spike’ Stent and Howie B. Assisted by Rob Kirwan and Femio Hernandez. Mixed by Mark ‘Spike’ Stent. Additional mixing by Howie B. Assisted by Conal Markey. Inspirational Decks and Loops: Howie B.
Holy Joe (Garage Mix): Music by U2. Lyrics by Bono & The Edge. Recorded by Mark ‘Spike’ Stent and Howie B. Assisted by Rob Kirwan. Mixed by Flood. Assisted by Rob Kirwan. Keyboards: Des Broadbery. Holy Joe (Guilty Mix): Music by U2. Lyrics by Bono & The Edge. Recorded by Mark ‘Spike’ Stent and Howie B. Assisted by Rob Kirwan. Mixed by Flood. Assisted by Rob Kirwan. Decks and Loops: Howie B. Keyboards: Marius De Vries. Loops: Howie B does Larry Mullen. Additional kits by Larry Mullen. Discothèque (DM Deep Club Mix): Music by U2. Lyrics by Bono & The Edge. Produced by Flood. Recorded by Mark ‘Spike’ Stent and Howie B. Assisted by Rob Kirwan and Fernio Hernandez. Mixed by Mark ‘Spike’ Stent. Assisted by Conal Markey. Decks and loops: Howie B. Remix produced by David Morales for Def Mix Productions. Additional production by David Morales and Satoshi Tomiie for Def Mix Productions. Remix engineer: Steven Barkan. Discothèque (Howie B Hairy B Mix): Music by U2. Lyrics by Bono & The Edge. Produced by Flood. Recorded and Mixed by Howie B. Assisted by Conal Markey. Remixed by Howie B. Contains sample from “Fane” performed by Freeform and written by Simon Pike, courtesy of Skam Records. Discothèque (Hexidecimal Mix): Music by U2. Lyrics by Bono & The Edge. Produced by Flood. Recorded by Mark ‘Spike’ Stent and Howie B. Assisted by Rob Kirwan and Femio Hernandez. Mixed by Mark ‘Spike’ Stent. Assisted by Conal Markey. Decks and Loops: Howie B. Remixed by Steve Osborne for 140dB. Remix engineer and programmer: Ben Hillier. Contains sample from “Fane” performed by Freeform and written by Simon Pike, courtesy of Skam Records. Discothèque (DM TEC Radio Mix): Music by U2. Lyrics by Bono & The Edge. Produced by Flood. Recorded by Mark ‘Spike’ Stent and Howie B. Assisted by Rob Kirwan and Femio Hernandez. Mixed by Mark ‘Spike’ Stent. Assisted by Conal Markey. Decks and Loops: Howie B. Remix produced by David Morales for Def Mix Productions. Additional production by David Morales and Satoshi Tomiie for Def Mix Productions. Remix Engineer: Steven Barkan. Contains sample from “Fane” performed by Freeform and written by Simon Pike, courtesy of Skam Records. Discothèque (DM Deep Instrumental Mix): Music by U2. Lyrics by Bono & The Edge. Produced by Flood. Recorded by Mark ‘Spike’ Stent and Howie B. Assisted by Rob Kirwan and Femio Hernandez. Mixed by Mark ‘Spike’ Stent. Assisted by Conal Markey. Decks and Loops: Howie B. Remix produced by David Morales for Def Mix Productions. Additional production by David Morales and Satoshi Tomiie for Def Mix Productions. Remix Engineer: Steven Barkan. Contains sample from “Fane” performed by Freeform and written by Simon Pike, courtesy of Skam Records. Discothèque (DM Deep Extended Club Mix): Music by U2. Lyrics by Bono & The Edge. Produced by Flood. Recorded by Mark ‘Spike’ Stent and Howie B. Assisted by Rob Kirwan and Femio Hernandez. Mixed by Mark ‘Spike’ Stent. Assisted by Conal Markey. Decks and Loops: Howie B. Remix produced by David Morales for Def Mix Productions. Additional production by David Morales and Satoshi Tomiie for Def Mix Productions. Remix Engineer: Steven Barkan. Contains sample from “Fane” performed by Freeform and written by Simon Pike, courtesy of Skam Records. Discothèque (David Holmes Mix): Music by U2. Lyrics by Bono & The Edge. Produced by Flood. Recorded by Mark ‘Spike’ Stent and Howie B. Assisted by Rob Kirwan and Femio Hernandez. Mixed by Mark ‘Spike’ Stent. Assisted by Conal Markey. Decks and Loops: Howie B. Additional production and Remix by David Holmes. Remix Engineers: Jagz Kooner and Gary Burns. Contains sample from “Fane” performed by Freeform and written by Simon Pike, courtesy of Skam Records. Discothèque (DM Deep Beats Mix): Music by U2. Lyrics by Bono & The Edge. Produced by Flood. Recorded by Mark ‘Spike’ Stent and Howie B. Assisted by Rob Kirwan and Femio Hernandez. Mixed by Mark ‘Spike’ Stent. Assisted by Conal Markey. Decks and Loops: Howie B. Remix produced by David Morales for Def Mix Productions. Additional production by David Morales and Satoshi Tomiie for Def Mix Productions. Remix Engineer: Steven Barkan. Contains sample from “Fane” performed by Freeform and written by Simon Pike, courtesy of Skam Records.